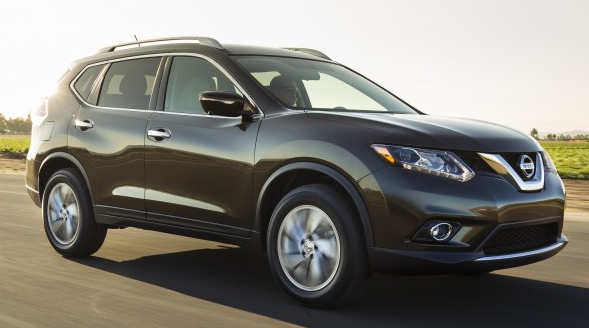 The 2015 Nissan Rogue Review: What is a rogue? Webster’s New Collegiate Dictionary says: 1: VAGRANT, TRAMP. 2: a dishonest or worthless person: SCOUNDREL. 3: a mischievous person: SCAMP. 4. A horse inclined to shirk or misbehave. That certainly seems like an unlikely name for a car, especially such a nice one. In fact, my Cayenne Red 2015 Nissan Rogue test car was the epitome of good behavior. The Rogue debuted for the 2008 model year, designed to go head-to-head with Toyota’s popular RAV4, Honda’s perennial top-selling CR-V, and the growing group of compact to midsize crossover SUVs. The first generation was softer in form, much as other Nissans of the day; the 2015 gets bolder shapes and sharper edges, notably at the headlamps and taillamps, and looks a little more, well, scamp-like. The new Rogue is available in three levels - S, SV, and SL. The base S is pretty well stocked with features, but the SV gets upgrades such as 17-inch alloy wheels, dual-zone climate control, privacy glass, push-button start, power driver’s seat and satellite radio. The SL adds, as you might expect, leather on the seats, steering wheel, and shift knob; a potent Bose audio system; and a navigation system. You can upgrade any model with a variety of option packages for improved style, comfort, functionality, or safety. My tester had the SL Premium Package, which brought an enormous panoramic sunroof, automatic-leveling LED headlamps, and a host of protective electronics known collectively as Safety Shield Technologies. That means blind spot warning, lane departure warning, forward collision warning, and moving object detection. With all of them activated, it seems like something was almost always beeping somewhere. No matter which model you pick, the new Rogue has one engine, a 170-horsepower 2.5-liter inline 4-cylinder, with a class-leading 175 lb.-ft of torque. It’s mated to an Xtronic Continuously-Variable automatic transmission, with a sport mode switch. You can get all-wheel drive on any model, if you feel you need it. The EPA gives the Rogue a rating of 25 City, 32 Highway, and 28 Overall. I averaged an even 23.0 mpg, likely because of my many hours of stop-and-go commuting. The Green scores are 5 for Smog and an above-average 7 for Greenhouse Gas. That’s good. My SL tester, with all-wheel drive, cruised down the road in near silence. It’s a friendly, if not exceptionally economical commuter. The seats are firm, but comfortable. The leather feels thick and strong, like that in a Mercedes-Benz - not cushy. The front bucket seats feature a special "zero gravity" inspired design, as in the Altima sedan. The articulated seat shape provides continuous support from the pelvis to the chest, helping reduce fatigue during long drives. Faulted several years ago for cheap-looking cabins, Nissan has turned the stylists and purchasing managers loose to make a significant upgrade, and they were very successful. The dash sweeps from left to right, with panels bulging out. They look formidable and padded but are actually hard plastic. My tester’s sparkly pseudo-carbon-fiber trim was attractive, and welcome in not mimicking wood. The tipped-back chrome gauge rings lend an elegant touch. Although the dash and doors are not heavily padded, the armrests are wonderfully soft and plush. You can now order up a Rogue with an optional third-row seat. The car isn’t huge, so legroom could be a premium, but it’s good to have the option in case you’re tasked with carrying the team to practice. In back, Nissan’s EZ Flex Seating System means every seat except the driver’s folds down easily, and the front passenger seat folds rearwards, so you can carry your surfboard or a ladder. There’s also the Divide-N-Hide Cargo System, with 18 different configurations. I liked the way the rearward section opened for hidden storage or folded back to create a slim, supported place for grocery bags. You can obscure the cargo area or leave it wide open, without using a shade-style cover. Nissan’s North American offices are in Franklin, Tennessee now, and the Rogue is built in Smyrna, Tennessee, a long-time company plant. Pricing starts at $23,650 for the two-wheel-drive S and heads upward to the SL with all-wheel drive, at $30,490. My SL AWD test car had a bottom-line of $32,615, including transportation and options. The compact crossover market is booming, so the Rogue has to be good to sell, and all signs point to another success. It’s the fifth of five redesigned vehicles for the brand in 2013-2014 alone. Wearing the new v-shaped grille and more than enough curves on its fresh new body, it is ready for action.